Kara is an ETB board member and is currently volunteering in Mae Sot, helping update the ETB website and working with Fred and Saya Joe on education projects. I first learned about Eyes to Burma from a talk Fred gave at my workplace in Ashland, Oregon. My boyfriend, Nick, and I were already planning a trip to Thailand later that year, in December 2012, and we wanted to visit and see if we could help with anything while we were there. In a whirlwind five days, we helped build a shelf in the community center and take a child with an infected cut on her leg to the Mae Tao Clinic. It was a life-changing week, which propelled us to continue volunteering from home over the next two years. I called Fred on a regular basis starting in January 2013 to get his updates and put together information for ETB newsletters. We worked with the ETB board on annual fundraisers. Also, Nick taught Fred how to use Dropbox in order to upload photos and videos of ETB’s projects. My perspective on Fred and his work is one of immense respect. Since I’ve known him, he puts almost all of his time and energy into working with the community, and he’s stayed with the work, even through very difficult times, over the past 7 years. 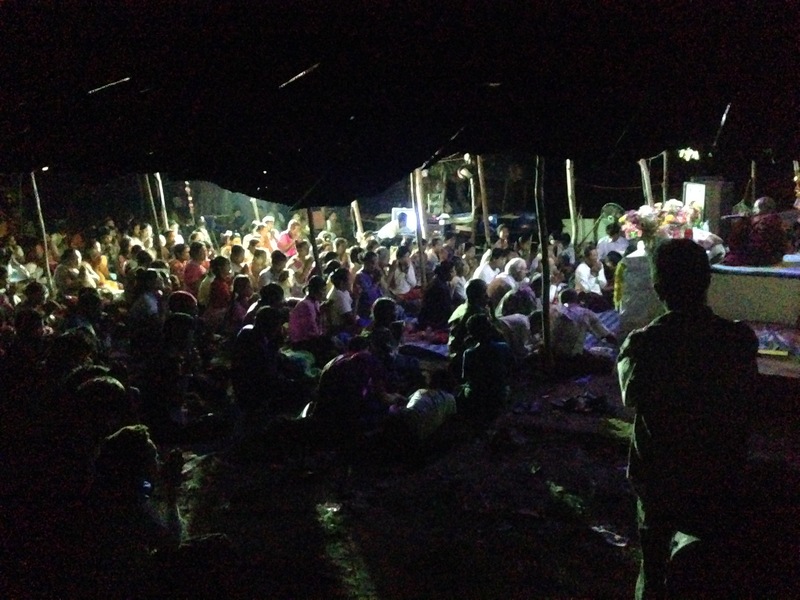 Three weeks ago, the community brought a respected monk from Burma to Buddha Land, the property ETB rents for people to live and recreate, and invited us to attend this special community-led event. I value ETB’s approach: build a safety net of essential needs (transportation to Mae Tao Clinic, clean water, emergency food assistance), listen to the community about what they need help with, provide tools people need to do things for themselves, engage in continuous problem-solving, support community-led events, help individuals and families start their own businesses, provide educational and recreational opportunities that give students and youth connections to life outside the dump. It’s more complicated than that and involves setbacks, sweat and frustration, and some heart-breaking situations. ETB’s methods are not perfect, nor is Fred a saint (he loses his temper when he sees waste and injustice and he does not have patience for some things), yet he is extremely honest and open. And regardless: Hard work is being done by our team and for the right reasons. With everything we’re doing, I am learning from Fred the importance of caution and respect for every individual in the community. He’s taught me to listen and watch to see what the students are interested in learning and doing, to not make promises I can’t keep, and to always consider a project’s cost, or a supply purchase, based on its long-term advantages and whether it will truly benefit someone or a group of people (and to make sure that I’m getting the best price). The latter is both for the benefit of the community, so ETB donations go as far as possible, and to respect the money donors entrust to ETB. Now, I’ve definitely made mistakes and unintentionally done the opposite of all those things since coming here in January, although rest assured my expenses have been with my own money; but, it’s a completely different world here with different stakes and situations than I’m used to. It’s a learning process. 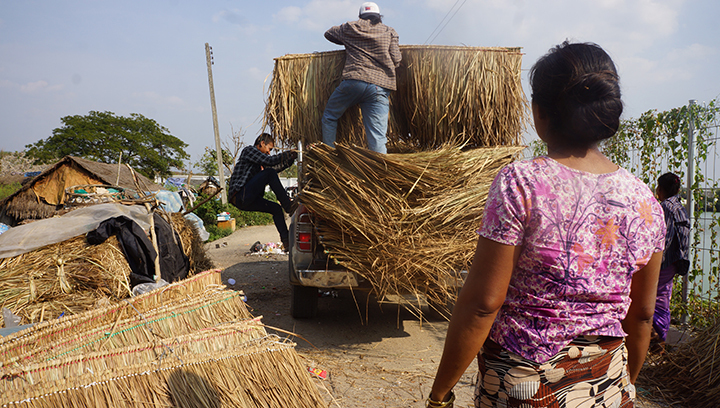 The woman in the foreground makes this thatch roofing. We’re helping deliver it to a family who’s rebuilding their house. 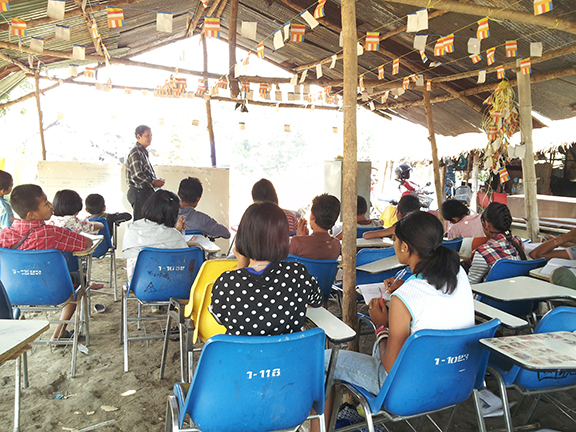 I feel very grateful for the work ETB does as well as for the work being done by countless other individuals and organizations assisting vulnerable communities in and around Mae Sot, including those who also work with the community at the dump. A very short list (that does not include everyone) are the donors and teachers of Sky Blue School, Mae Tao Clinic and its many programs (like Children’s Development Centre, CDC), SAW, Help Without Frontiers, Borderline Cafe, Yaung Chi Oo Workers Association, The Border Consortium, Solidarite International, UNHCR, and so many more. While I’m here for the next couple months, I’ll be working with Fred, the community, and ETB’s invaluable teachers and helpers, Joe, Zulu and George. I look forward to updating ETB’s website with current information about ETB’s work, including our clean water and education projects. 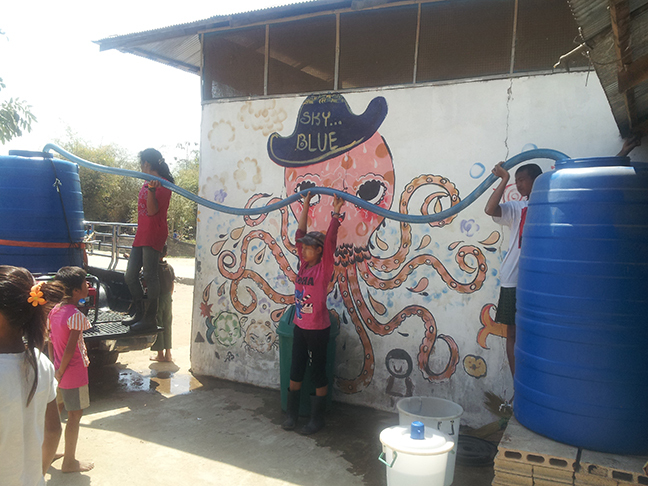 Filling the water tank at Sky Blue with three of the many helpers who are eager to do the water runs with Fred. ETB’s Thai teacher leading a Saturday morning class. The chairs and large white boards were donated by a school that closed nearby. This entry was posted in Mae Sot Volunteers. Bookmark the permalink.